When I was young, I can remember asking my mother what she wanted for her birthday. She usually said “peace and quiet” or “the house to myself.” In my extreme childless innocence, I was genuinely perplexed and always felt a little sorry for her. Why on earth, I used to wonder, would she ask for such a crap, stupid present? I thought it was because she knew as kids we didn’t have money and my mother, being the ever thoughtful person that she is, was asking for something we could actually give her. Or just messing with us. Fast forward thirty really, really fast years later and I get it. I totally get it. That would be my ideal birthday present. And Valentine’s Day present. And Christmas present. And mother’s day present. The gift of time is an excellent present. On Saturday morning I was given something else. The Awesome Foursome presented me with a dead butterfly they found on the landing. It was perfectly whole; wings open as if to fly off and everything. Literally frozen in time. Then Juno got it and shredded it with one lick. It was a thing of beauty while it lasted. Anyway, in a moment of boredom I compiled my 40 shades of aging list. Here it is. My birth cert says so. 3. I don’t go to the pub very often any more. 4. When I do go to the pub, I need a seat. 5. When I do go to the pub and get a seat, I feel like I am in a very loud crèche. 6. I don’t mind when I discover a lump of marmalade stuck to my jaw line. One that’s been there since breakfast. Which was 8 hours ago. Ditto the go faster stripe of Weetabix down my trouser leg. 7. I say things like, “because I said so,” “could be worse,” and “I’m your mother, that’s why,” without batting an eyelid. I don’t even try and stop myself. 8. I need to wear a “slimming” garment when I wear a dress. About once a year. 9. I have three of the above slimming garments. All guaranteed to depress me into the ground through their sheer necessity and total unsexiness. Beige underwear is just so, so foul! 10. When I put my hand into my pocket I could find anything from used tissues to bits of Lego and old receipts. 11. I call all my married friends by their maiden names. 12. That crepe paper look on my cleavage area doesn’t smooth out by midday anymore. 13. Above cleavage area is migrating. Fast. 14. I start worrying when there are new freckles on my hands. They’d better not be bloody liver spots!!! 15. The highlight of my weekend is a few glasses of Pinot Grigio and a weeks worth of Home and Away on the player. 16. When the kids at the school gate call me “Conor and Iarla’s Mammy.” Total annihilation of my identity right there. 18. I can remember the “Where’s Grandad?” Health and Safety ad on television. 19. I can remember Ray D’Arcy when he was on Jo Maxi. 20. I can remember Jo Maxi! 21. I used to eat Snickers when they were Marathons. 22. I know what Fizzle Sticks are. 23. Two day hangovers. ‘Nuff said. 24. Sleep is a luxury not a given. 25. Once upon a time I was afraid to stay at home in case I would miss something. Now I don’t give a shite. 26. Five year plan goes out the window. Now it’s called a bucket list. 27. I swear New Kids on the Block and The Backstreet Boys were men compared to the boy bands that are out today. 28. Emmerdale Farm is the same age as I am. 29. I got my hands on a ticket to see Brax, the ridey one from Home and Away, and I offered it to someone else. I know I won’t be able for all the screaming and jostling. 30. I think I would like a mid-life crisis but (a) I don’t know how to go about having one and (b) I’m too tired. 31. I run for and have answered my mobile only to discover it’s Bob the fekin Builders phone ringing on the TV. 32. I’ve never had a jaeger bomber. Nor do I want to. 33. Prescriptive text makes my head spin and I haven’t been able to master Twitter. 34. I know more about The Wizards of Waverly Place than Homeland or Love Hate. Or any television show on the box after 9pm. 35. I remember the original Pippa from Home and Away. 36. My FMB’s are chew toys for the dog because they no longer fit and have pointy toes. Round toes are “in” now. 37. While we are on the topic of shoes, anything higher than a flip flop becomes strictly a Car to Bar shoe. Once upon a time I wouldn’t have batted an eyelid at vertiginous heels, now just looking at them makes my eyes water and feet bleed! 40. Music is “loud” now and I won’t let the kids turn the sound up past number 10 on the remote control thingy. People have told me age is just a number. It surely is. A big fekin’ one! Anyway, I’m here now and time waits for no-one. 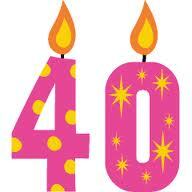 Here’s to the next 40 and if they are as good as the first 40, I shall consider myself very fortunate indeed. Ha ha ha, I was just thinking about the "original" Pippa the other day... Sadly, I can identify with practically everything you said... And I'm not too near 40 yet!!!!!!! Emily, I was aware when I was putting my list together that a lot of those things aren't really age appropriate at all - more 40 signs that i have kids. Unfortunately it was equally as careless. His family left him alone on the banks of the river and he fell in as he was retrieving a football.